Katherine Babich (nee Woronchak), age 93 of Lorain, passed away peacefully on Tuesday, January 30, 2018 at Avon Place in Avon, Ohio. Born September 1, 1924 in Lorain, she lived in Lorain her entire life. Katherine graduated from Lorain High School in 1942 then worked at General Industries during World War II. She also worked as "Rosie Riveter" on B-29 airplanes in Cleveland and at Thew Shovel in Lorain. She retired from Caster's Food in 1991. Katherine was a member of Ss. Peter and Paul Orthodox Church, Lorain where she was a member of the church choir and the St. Mary's Women's Club. 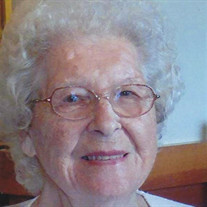 She enjoyed baking and cooking and was an avid Cleveland sports and Nascar fan. Surviving is her son, William S. Babich of Lorain; granddaughters, Michelle (Kevin) Hill of Lorain and Kristi (Randy) Garcia of Hawaii; great grandchildren, Jayden, Devin, Alliyah and Darien. She was preceded in death by her husband of 45 years, George in 1993; her son, George K. Babich in 2016; parents, John and Rosalia (nee Vereszak) Woronchak; brothers, Nicholas Woronchak and William Woronchak; sisters, Mary Kucharek, Emily Cataldo and Anna Rumack. The family will receive friends on Friday from 4:00 - 8:00 pm in the Dovin Funeral and Cremations Specialists, 2701 Elyria Avenue, Lorain, where a Parastas will be held at 7:00 pm. The family will also receive friends on Saturday from 9:30 until the time of funeral services at 10:00 am at Ss. Peter and Paul Orthodox Church, 2238 E. 32nd Street, Lorain. Rev. Fr. Basil Stoyka, will officiate. Burial will follow in Elmwood Cemetery, Lorain. Contributions can be made to Ss. Peter and Paul Orthodox Church, 2238 E. 32nd Street, Lorain, Ohio 44055.